TrailMaster Makes very high quality Gokarts. This MID XRX-R utilizes a vertical 196cc/6.5HP engine with a Automatic varator clutch that provideds loads of low end torque. Heavy duty frame, Oil dampend shocks and 16" Tires W/8" Rims. This is a MID sized Go Kart and offers Bucket seating for two, W/4 point racing harnesses, Grill mounted head lights and tail light. This Kart comes with Electric start, Plus an industry first Back up pull start (no battery power needed). 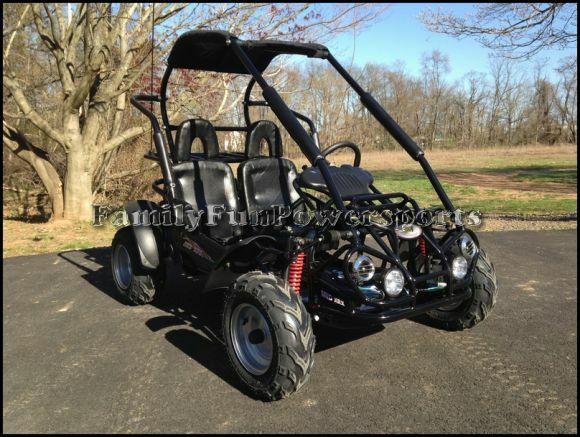 This kart also features hydraulic Rear disc brakes, Heavy duty Drive system, and Adjustable Seating. Pedal distance to vertical seat back: 31" - 37"